Some people are aware of the history of Longlands, and how it came about following the demise of the school. However, our research has uncovered much more items of historical interest which paints a fuller picture of this stage of the Estate's life. This chapter starts in 1952, when Miss C. E. West decided that the remaining part of the estate of over 30 acres was considerably in excess of the actual needs of the school. The lower portion of the estate (First, Second, Third Fourth, and Fifth Avenues) had already been sold for development in c.1928, with some upper parts (First Avenue to the north). She submitted an application for the development of 21.5 acres into housing. Efforts to sell the school and surrounding land to various educational bodies had failed, but people wishes to buy the property for houses. 'The Herald understands that if building takes place, the school would retain a site of 9 acres, including the tennis courts, swimming pool, and lawns'. For c.18 months, objections were placed against the plan including from both the local council and the Minister of Housing and Local Government. However, in May 1954, a 'turnaround out of the blue' was reported and the planning was granted. 'The school position fell within the council`s Local Development Plan, and they did not object to the proposals. The school, remaining grounds, formed part of the Charmandean Estate, other portions had already been developed, and despite the land rising to the slopes of the downs, the estate was effectively screened from the downland area beyond by trees'. (this was an important factor, as mentioned later). The planning submission was referred to the Minister of Housing and Local Government, who stated 'he considers that this must form the absolute limit of urban development in this part of the town'. It is unknown at which point Miss C. E. West decided to move the school to Buckinghamshire, thus selling the whole remainder of the Charmandean Estate and not just the surplus land, or what factors prompted the decision. In August 1954, a group of the existing residents, concerned to preserve the amenities and character of the area, formed a company to purchase the school, so it could be re-sold to a developer but only with keen restrictions on the land. citation: Worthing Herald, 3rd Sept 1954, from The British Newspaper Archive. This article confirms the stories we have heard that owners of properties on the north side of Fourth Avenue, had the option at this time of extending their gardens to the north; in total being 4.5 acres offered to those residents. 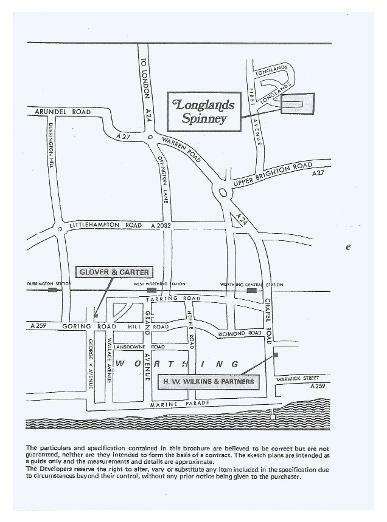 We believe this was taken up by all the owners on the West end of Fourth Avenue, however it is unclear if those on the East end were offered this opportunity as it would have affected development and creation of Longlands Spinney. Can any residents confirm this? 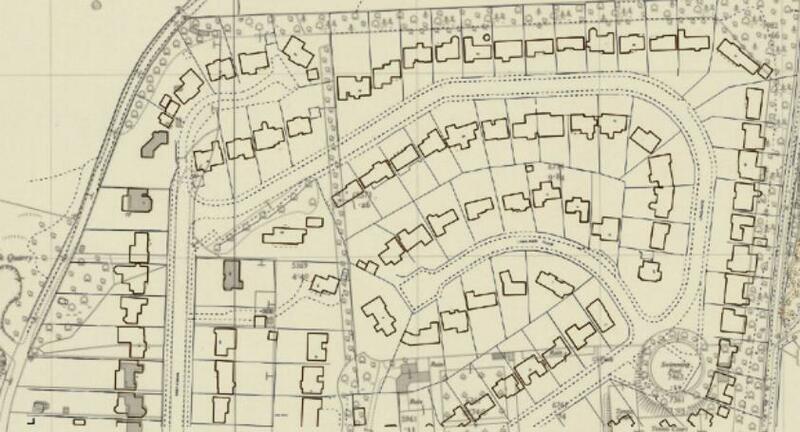 May 1952 - Decision made to apply for planning for the majority part of the estate for development, retaining 9 acres for the school. There have been many stories and articles about exactly how Charmandean House fell into disrepair, and some tragedies where people died; we believe intentions were to turn the mansion into flats however a large, empty, secluded mansion resulted in theft, fires, and trespassing. These incidents no doubt resulted in the decision to demolish the house itself, which laid the path for complete redevelopment. 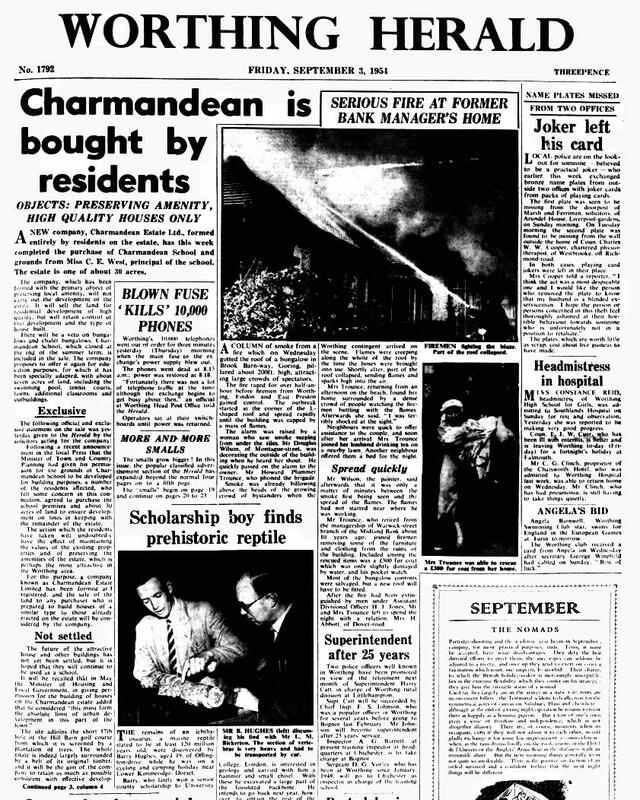 There is an article about a fire at the mansion in the Charmandean House section of this site, with the Worthing Herald article from April 1960. The following articles reference the information above, but we have included for readers' interest as it's interesting how the stories were told in the day. 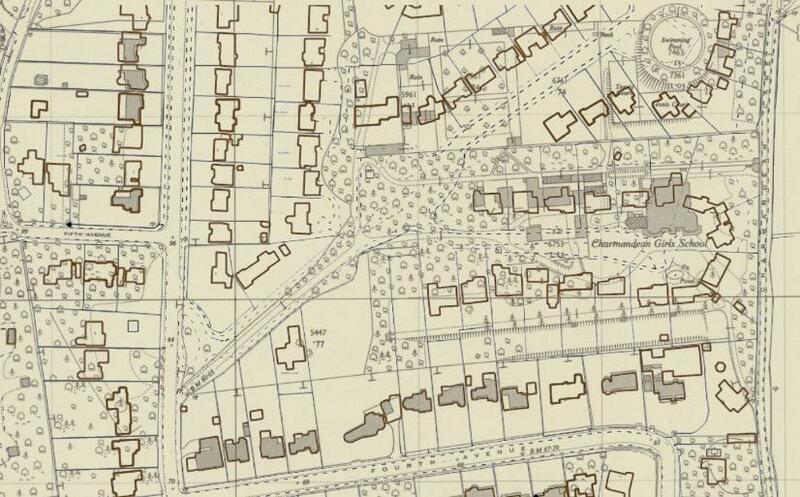 We haven't uncovered much information about the actual development of Longlands apart from information which is already mentioned in other parts of this site, but some items should be mentioned specifically here as they are of historical interest. One of the houses built in Longlands had the initials of Frank Sandell on the chimney in different coloured bricks. We also have been told that a wall of one of the houses being developed fell in during a storm. When Longlands was developed, and the house was demolished, it is currently not know what happened to the features of Charmandean House, such as the Stained Glass window from Broadwater Church and other items of historical interest. We know some of the features were recycled in houses in Worthing, such as Rectory Cottage in Broadwater. See News. 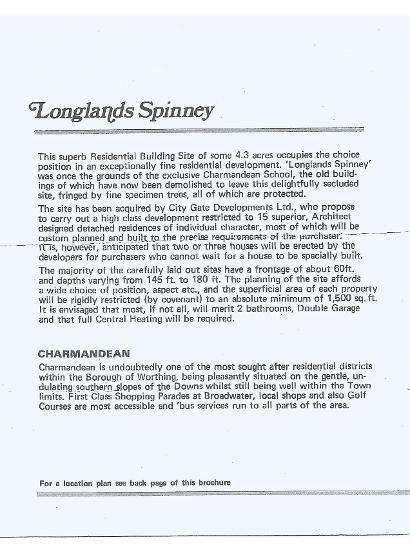 How was Longlands development planned? 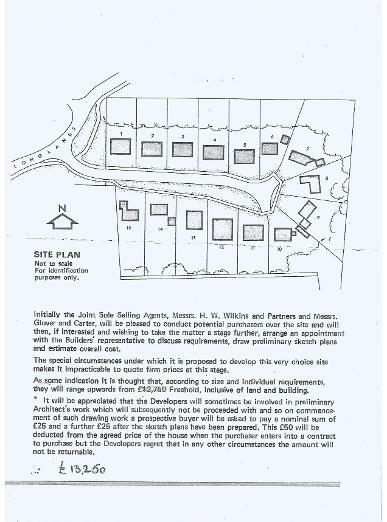 When developing the remaining 25 acres of land, the developers seemed to plan based on some features they already had, and also to work round the tight restrictions (covenents) placed on the land. The south entrance to Longlands follows the route of the original East drive of Charmandean House, with some of this being maintained with the curves of Longlands Spinney.. The Spinney was shaped as such to both take advantage of features, and to avoid others - some of the Northern Spinney houses have garages underneath the houses, thus taking advantage of the cellar space beneath the original house. To the South, they are set back from the road, so the builders weren't building on potentially wet land where the original fountain feature in front of the mansion was located. Original lines of protected trees were maintained, on the boundaries but also running North-South through the development. Where the swimming pool was located, the planners set the houses back from the road, hence the reason for the long drives back from the road. To best show this, and where the house would have sat today, we have overlaid a modern 2018 map against 1954. Despite this, we still haven`t managed to find the location of Mrs Thwaytes' 'ruin', where she re-built the stained glass window from Broadwater Church. 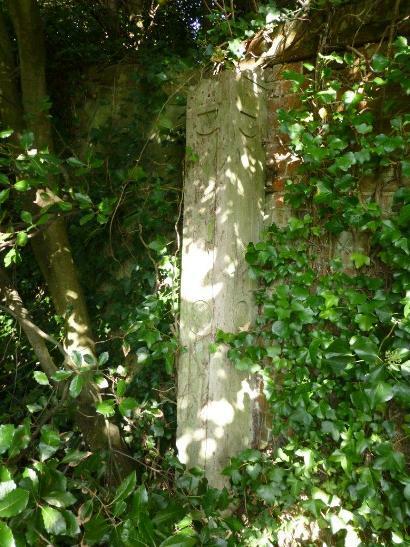 We know it was in the woods at Charmandean, but unaware of it`s location or whether it still exists today. Have any residents in Longlands Glade or Longlands found anything worthy of mention such as foundations in their gardens? Many thanks to the residents to have shared this with us, as it is a great insight into the past. Note the frontage of each property, being c.60', and no less than 1500 sq.ft. 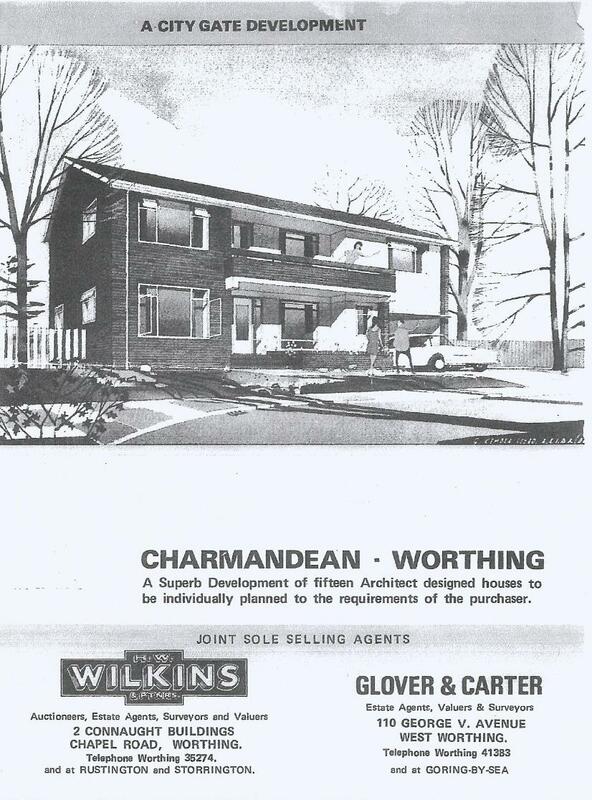 which were among the restrictions placed on the sale of the land by Charmandean Residents. As Longlands Spinney is built on the land where the original Charmandean House was located, it is only correct there are some key features still present which provide a hint to the past. All of the features are in private gardens, and as such we have taken care to preserve the owner's privacy. Other pages in this site refer to 'Charmandean's Tower', which provided a fantastic lookout from Brighton round to the Isle of Wight. Although it is rumoured this was demolished during the war years, the foundations are still there and original mouldings of the formwork are still present on the adjoining flint wall. 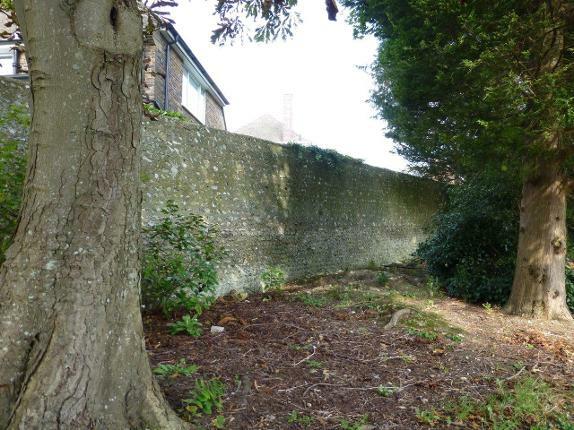 This wall is the southern part of the 'kitchen garden', which was an amazing 3 acre site, protected from the elements by a tall 6 foot plus flint wall. This can be seen on maps and photos over the years, and by piecing together the paths through the wood set north of the mansion. Throughout the history of Charmandean House, there has been mention of a famous 'Yew Walk', where supposedly the monks associated with Broadwater Church liked to frequent. During the time when the House was present, the Yew Walk consisted of a line of Yews running East-West from the West Driveway (off Charmandean Lane) ending at the East end with a garden structure which has been known as 'Garden seat', 'Italianate Summer House' or 'Folly'. 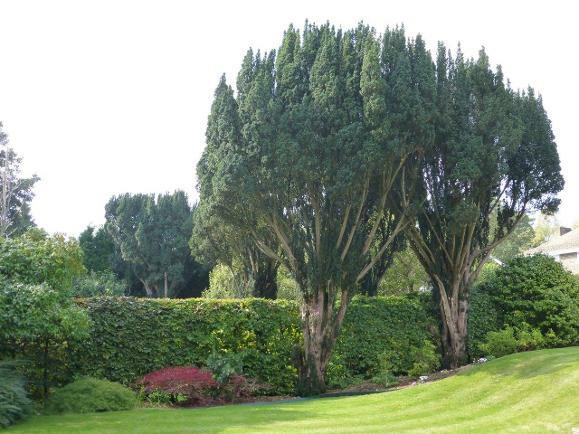 The Yews were c.1m apart, however during development of Longlands Spinney, they were thinned and we believe a minimum of pair of Yews was retained on each of the boundaries, under a TPO (Tree Preservation Order) for each house. This is an example view of the Yews today, aged c.120 years old, looking West. The slope of the lawn is where the original lower lawns from the house, would have had steps from the upper to lower lawns. If you have photos like this or have found original remains in your gardenwhich you would like us to share then please contact us.